You can now experience the world of eTalking Books and eBooks together using BorrowBox. Register once and download eBooks or eTalking Books to your device using the BorrowBox app. Full instructions are given on the site or have a look at the guides below. West Lothian eBooks and eTalking Books How to Guide [9Mb]. Download eTalking Books onto your tablet, phone or MP3 player, so you can listen where and when you like. Simply register on the site with your library barcode and PIN (usually the last four digits of the phone number we have on record for you), then login and start searching. 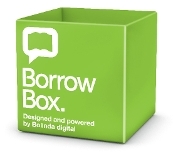 Download the BorrowBox app and start borrowing today. You can borrow up to 10 titles at a time and like the eBooks, they expire at the end of the loan period, so no overdues. You can also return titles early to borrow other eTalking Books. The library service aims to have a varied selection of eTalking Books available to our customers. We have recently moved to a new provider and plan to add more content to increase the collection on a monthly basis. As we operate within a small budget stock suggestions can be made by emailing library.info@westlothian.gov.uk. Please give details of the book you would like to suggest and why you feel it would be a worthwhile addition to stock. All recommendations will be considered, but it may not be possible to purchase all suggested items. This month's eTalking Book of the month is Major Pettigrew's Last Stand by author Helen Simonson, narrated by Bill Wallis. Major Ernest Pettigrew is contentedly leading a quiet life in the sleepy village of Edgecombe St Mary. Things start to change when his brother dies and he seeks the company of a local female who shares his love of books. Funny, comforting and heart-warming, Major Pettigrew's Last Stand proves that sometimes, against all odds, life does give you a second chance. For children, this month's top title is The Subtle Knife, the must-listen to second instalment of Philip Pullman's Dark Materials series. The character Will Parry is introduced to us in this BBC Radio 4 dramatisation. The RNIB has made their Talking Book Service available free of charge to any UK resident who is blind, partially sighted or who has an impairment that prevents or limits them from reading standard print. There are 25,000 unabridged titles available by digital download through RNIB Overdrive or Daisy CD and USB stick delivered by post. The titles can be downloaded to computer, tablet or smart phone using the free Overdrive app. To use the postal service you will need either a DAISY CD or USB stick player, or device that plays MP3 files. Simply register on the RNIB site to sign up for this service if you meet the eligibility criteria. Full instructions and help are available on the RNIB site.